ThermoPEX insulated piping saves energy and maximizes efficiency by keeping heat loss to a minimum.� Greater system efficiency maximizes the delivery of heat from each pound of wood. Reduces wood consumption. ThermoPEX is flexible pre-insulated piping that is ideal for use with outdoor wood furnaces. 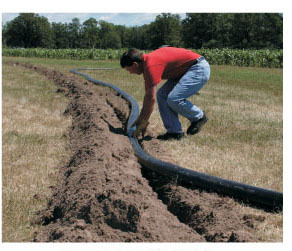 ThermoPEX consists of two 1-inch* oxygen barrier Central PEX lines or two 1-1/4 inch** oxygen barrier PEX lines (supply and return) that are insulated with high-density urethane insulation and a thick, durable, waterproof, polyethylene outer jacket. *CTS ASTM 1" supply and return. **CTS ASTM 1-1/4" supply and return. ®™Trademarks of Central Boiler, Inc. 1-800-248-4681 ©2009 Central Boiler, Inc. All rights reserved.